See who's watching you online - and put a stop to it! Your privacy is at risk every time you open your web-browser. Data krakens trace your every move while trying to build a comprehensive profile of you and your activities. Cookies, digital fingerprints and stored IPs help these data collectors in their dubious cause. Enter TrackOFF Standard! This program was specifically designed to prevent data collectors from getting their hands on your data. Protect yourself and your data with a single click! TrackOFF prevents third parties from linking your identity to your PC. This high-quality software ensures your digital fingerprint won't fall into the wrong hands during online browsing. TrackOFF deletes files that contain confidential information about websites you visited from your computer. With TrackOFF, you can search the web knowing your requests won't be stored or sold. TrackOFF protects your identity and data through a combination of pro-active measures (by shielding your data while you surf the web), retroactive measures (giving you the ability to delete your browsing history and super cookies) and real-time protection (by masking your digital fingerprint, IP address and location). Proactively prevent data theft while you surf the web and retroactively delete any web browsing traces. With many programs, data encryption is a complicated affair. With TrackOff, all it takes is a single click to activate encrypted browsing for heightened security, e.g. during online banking. Innovative technology prevents third parties from acquiring personal, financial or medical details and more about users. Tracking cookies that are difficult to remove contain comprehensive information about you and the websites you visited. TrackOFF eliminates them in just seconds. Have you ever wondered who might be watching you online? TrackOFF shows you which websites track your activities. Regular search engines store and sell your search requests. The private search built into TrackOFF enables you to search truly anonymously. 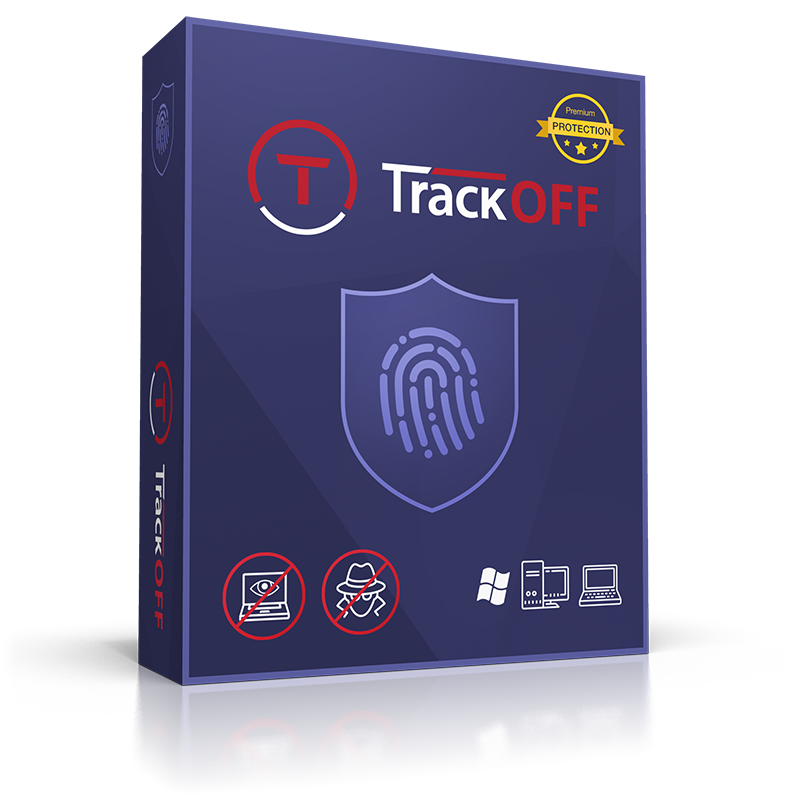 TrackOFF is the only tool to prevent fingerprinting without disrupting the web browsing experience. Digital fingerprints combine data about your web browser and computer to create a unique identifier used to track you around the web. Recently, use of this technique has increased significantly. Scientists believe, it will very soon replace cookies as the most important means of online tracking. Since TrackOFF prevents the creation of genuine fingerprints, your data is always safe. How does TrackOFF prevent fingerprint-based tracking? 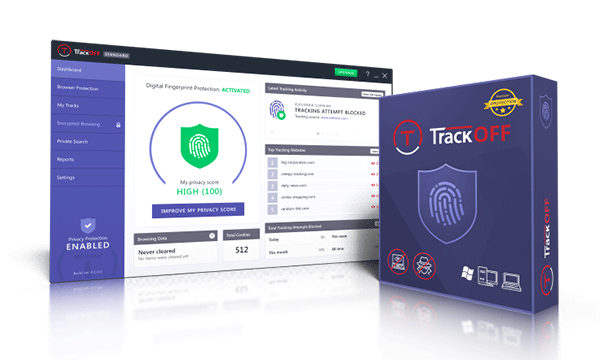 At random intervals, TrackOFF injects fake information into data used to create your fingerprint. This way, trackers receive false information while you stay anonymous! How does TrackOFF detect tracking attempts? TrackOFF uses heuristics to detect known methods of fingerprint creation in scripts used by data collectors. While you're browsing the web, you may see notifications informing you of failed fingerprinting attempts. Secret service agencies and hackers can locate you based on your computer's IP address. TrackOFF's built-in encrypted browsing feature provides effective protection against this. It takes just a single click to activate the built-in VPN technology for extra security during sensitive data transactions, like online banking.